The Africa Energy Forum: Off The Grid’ invited Lendahand Ethex’s Managing Director Danny den Hartog to speak about the importance of providing flexible financing for Off Grid Solar Solutions in Sub-Saharan Africa.The conference was held between 6-8th February in Kampala, Uganda and focused on the topical issues concerning rolling out off-grid solar projects across Africa and how affordable solar energy access across the continent could be further accelerated. The panel included speakers from the World Bank, KFW (German Development Bank), SunFunder, Development Bank of Southern Africa and NedBank. According to the most recent GOGLA report over the next 5 years $2.5 billion of additional investment will be needed to increase energy access in emerging markets. 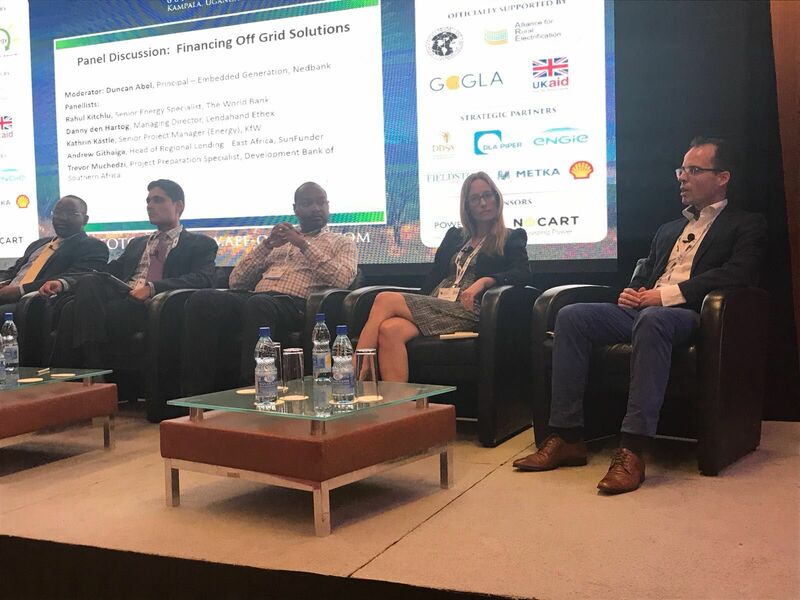 Danny shared thoughts alongside those of his fellow panellists around how impact investing platforms can help to fill the financing gap as part of a range of different financing solutions. Specifically, Danny highlighted that direct impact investors could provide opportunities for growing solar business to raise affordable funding via crowdfunding. By accessing low cost flexible finance in this way solar businesses are able to scale their businesses and impact significantly. Furthermore, the ongoing development of financial instruments such as first loss cover, match funding and partial credit guarantees is also helping to create a growing community of retail investors who want to invest directly in companies that have a quantifiable social and environmental impact whilst also generating a potential financial return. Indeed, one of a series of important recommendations from the EU’s High-Level Expert Group on Sustainable Finance in their recent report was the urgent need for the finance sector to ‘enable retail invests to invest in sustainable finance options in line with their own personal values and motivations’. Platforms such as Lendahand Ethex are helping to provide a growing community of impact investors with these kinds of opportunities. Investing in the projects promoted by Energise Africa involves risk, including the loss of some or all of your invested capital, and returns are not guaranteed. These are fixed-term bonds, and funds cannot be withdrawn until the end of the investment term. Please read the full risk warning before deciding to invest.